I am completely, crazily, head over heals in LOVE with Pinterest. If you are not familiar with this addiction site, you are missing out! At this point it is an invite only site, but is COMPLETELY free. Send me your email address and I would be more than happy to send you an invitation. Addicts like company, right? So what is Pinterest? From their site, ” Pinterest lets you organize and share all the beautiful things you find on the web. People use pinboards to plan their weddings, decorate their homes, and organize their favorite recipes.” I used to buy decorating magazines when the family budget would allow (Wow! They are expensive and chock full of ads!) and I would pour over the pictures and tear out my favorites. I had a folder full of “inspirational” pictures that I hoped to use one day. It was not exactly the most organized system and I could not share the pictures with friends easily. Pinterest fixed all of that for me. No more spending money on magazines or overflowing folders with tears sheets. I have been on Pinterest for about 8 months and I will admit it is completely addicting. I have rationalized spending WAY TOO much time “pinning” (adding pictures to my boards) in the name of “research” for my business. I need to know what is happening in the marketplace, right? I have 95 boards and 1,607 pins. Ummm, yes, that is A LOT. I admit it. It is just that there are so many great, inspirational ideas floating around the web and I WANT TO USE THEM ALL! 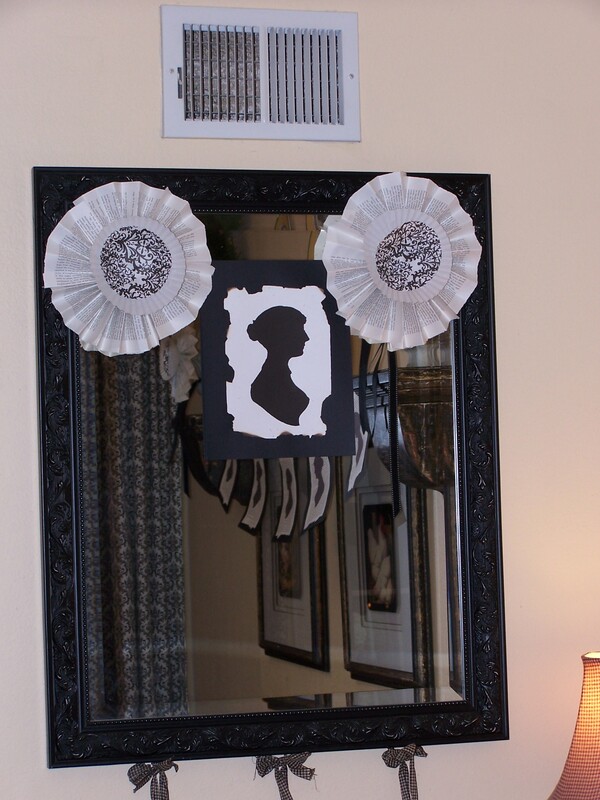 This picture was my “inspiration” for my Jane Austen Pride and Prejudice Book Club dinner party last month. I adore all of the books covered in white paper. But how do you tell the title without having to remove the book from the shelf? I may need to try this and see how “user-friendly” it actually is! I don’t know about you, but I have to live in the real world. And I am styling REAL rooms and REAL parties. I learned not so long ago that many of the events that people have pinned are “staged events”. Sure it is easy to make everything look perfect when you don’t really have guests showing up in 20 minutes and you still need another hour to finish the cupcakes, not to mention your hair is wrapped in a towel! Now I am not objecting to these amazing events and the pictures that I get to pour over. But it’s a lot of pressure to live up to! Most inexpensive “table-cloth” ever. 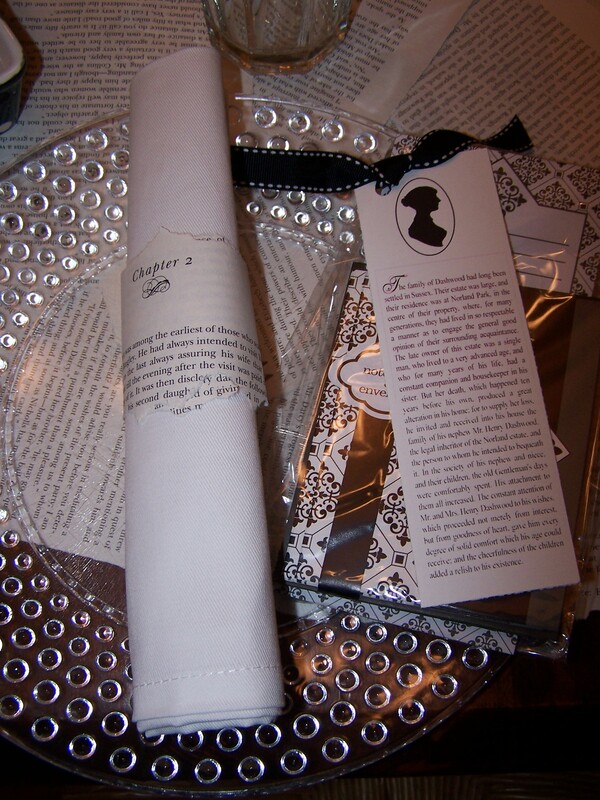 $7 BARNES & NOBLE Classic paper back Pride and Prejudice book. At first, I felt really guilty ripping into the book. 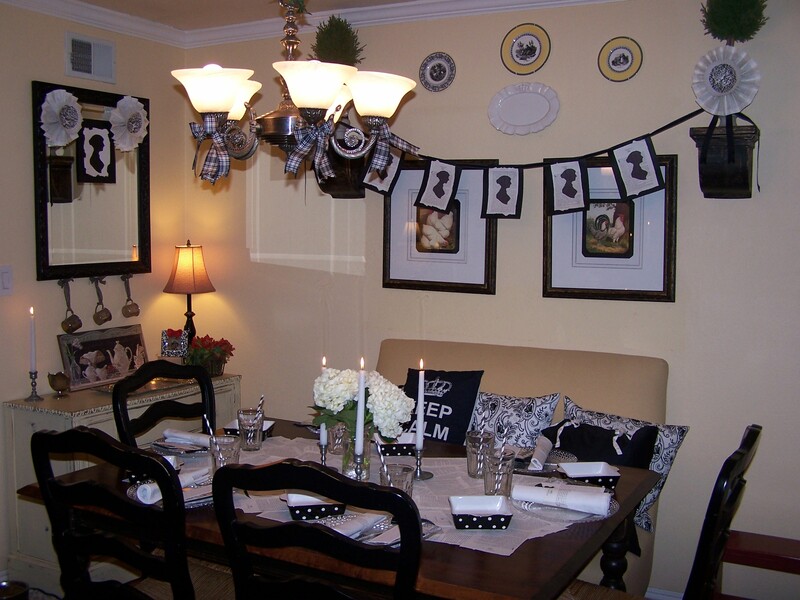 I used it for the table-cloth and bunting. Tearing into a book. Literally! 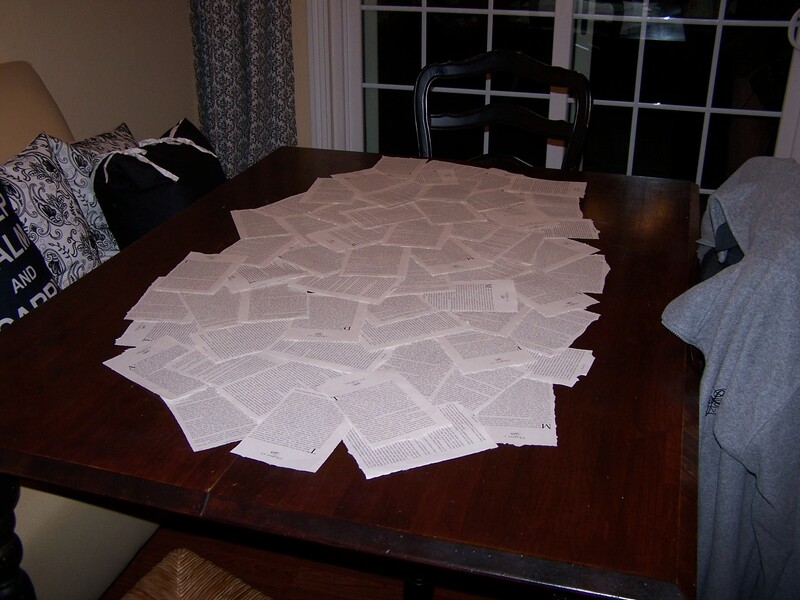 Arrange pages in a random pattern so you can read from any seat! 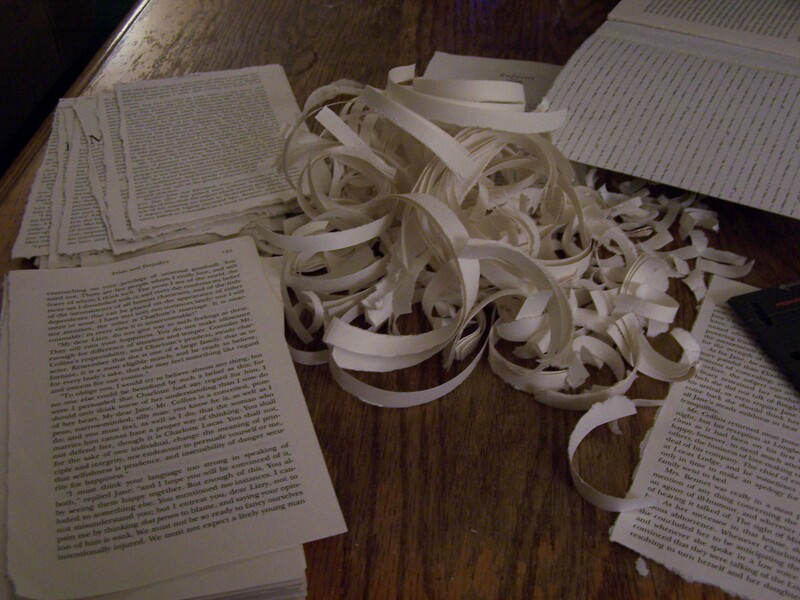 Book pages fanned and stapled together with cupcake wrapper center. 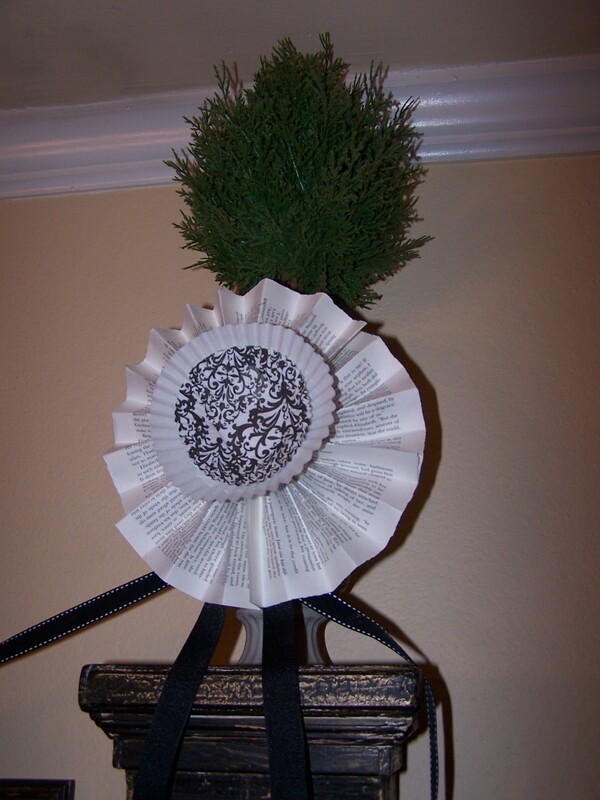 Jane Austen silhouette found on web for free. My point is, these pictures are an amazing RESOURCE to use for inspiration when I am styling an event or room. And I ALWAYS seem to be working with a tight budget and that means I need to be really creative to try and pull off these looks inexpensively, but make it LOOK like no expense was spared. My hope is that we can all shrug off the notion of “PERFECTION” and embrace our perfectly imperfect confections, parties and rooms! PS. 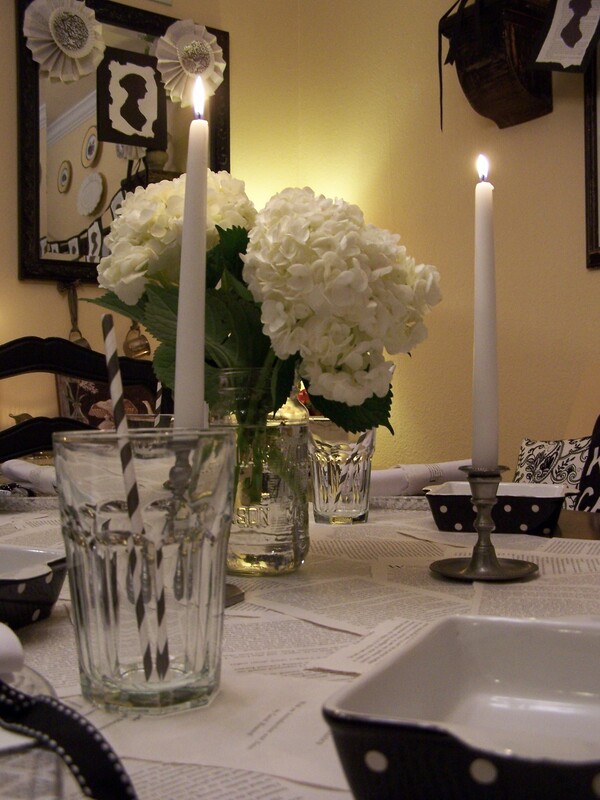 My dinner party decorations cost a total of $10! PPS. Feel free to pin my pictures onto your Pinterest Boards. I plan on watermarking my pictures as soon as I can figure out how to do that! PPPS. Also, don’t forget to signup to “Follow” my blog by entering your email address. When I hit 100 email subscribers, I will be having a special give-away!